Sol 2019, April 11, 2018, update by MSL scientist Lauren Edgar: For the past few sols Curiosity has been exploring a diverse assemblage of cobbles and boulders on Vera Rubin Ridge, trying to understand how this blocky deposit came to be, and what the variety of rock types can tell us about geologic processes in Gale crater. 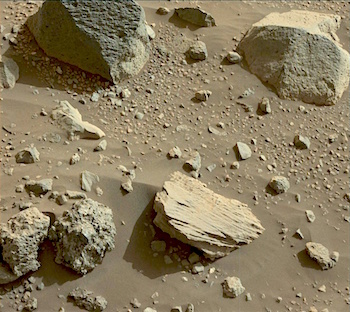 We’ve been really excited by the diversity of rock types, as seen in the above Mastcam image. The team decided to stay for one more full day of contact science before driving away in tomorrow’s plan. This entry was posted in Reports and tagged Aeolis Mons, Curiosity, Gale Crater, Greenheugh, Mars Science Laboratory, Minginish, Mount Sharp, MSL, Murray Formation, NASA, Rousay, Sanquhar, Vera Rubin Ridge. Bookmark the permalink.